Oftentimes a great fishing trip can be better defined by an angler's perspective than by the fish caught, and St. Helena Sound, in the heart of the ACE Basin, offers plenty of both for those open to unseen possibilities. A lousy day of fishing beats a great day at work, right? Well I've spent some long days on the water - call it fishing if you want to - when all I could think about was how much better off I might have been back at the office. Of course, those were not days spent cruising the ACE Basin with Jim Goller and Olin Chassereau. Last year, on a perfect December day, we caught spottails and seatrout in St. Helena Sound and found inspiration that only time enjoyed outdoors with friends can offer. "I grew up fishing freshwater farm ponds and swamps," Goller said. "Stanley Carter, a local man who ran the Esso station in Erhardt, thought a lot of our family and he took me fishing a lot when I was boy." Goller, now executive director of the Hampton Wildlife Fund, went on to explain how the freshwater fishing transitioned to saltwater fishing over time. "Although I didn't realize it back then, it was the friendship and not the fish that stuck with me," Goller said. "That's what I remember." Chassereau also grew up in Erhardt, a smallish Lowcountry town where everyone living there still knows their neighbors, and folks treat each other like family. Although Goller was a few years younger, like most everyone else in Erhardt, the two became acquainted. And that is how this perfect December day began, with old friends, a beautiful backdrop and just enough fish to keep the day interesting. Mel Bell, an SCDNR marine biologist working at the Fort Johnson office near Charleston, is quick to say that South Carolina is "blessed to have a wide spectrum of healthy, diverse and valuable saltwater fisheries up and down the coast, and that a significant portion of our essential estuarine habitats are found within the boundaries of the ACE Basin." 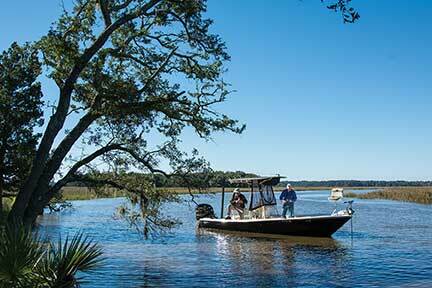 The ACE Basin Project began in 1988 with a small band of dedicated, conservation-minded folks who saw the need to protect the Ashepoo, Combahee and Edisto river drainages that feed into St. Helena Sound. Landscape-scale habitat protection such as this - nearly 350,000 acres - had never been attempted before in the U.S. The success of the effort has rendered the project a model for other large-scale conservation programs around the country. Although a significant portion of the properties in the ACE Basin still is privately held, there are thousands of acres of public lands and water where all citizens can go to enjoy the scenery and the resources the habitat makes possible. Of course the SCDNR was an early partner in the ACE Basin project, and the agency continues to play a significant role in the management of public lands in the area and in the implementation of recreational activities for hunters, anglers and non-consumptive users. 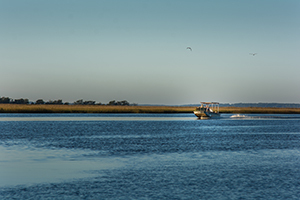 Bell explains how marine resources in the Palmetto State support both recreational and commercial fisheries that not only benefit South Carolina economically, but just as importantly serve as a means of recreation for citizens. The state boasts more than a half-million acres of salt marsh and more than two thousand acres of intertidal oyster beds, he says. "Due to the relatively low level of land development and less human population within the ACE," Bell said, "water quality and overall estuarine habitat quality is better than many other locales where stormwater drainage, heavy water traffic and other issues associated with high levels of coastal development are present." Most kids in South Carolina grow up fishing in fresh water, but many of them dream of bigger adventure and bigger fish along the coast. Goller was no different. "I always wanted to fish in the salt water," he said. "So I bought a little boat and started fishing around the reefs and wrecks for spadefish. One day, some buddies and I really got into the fish, and we caught some big ones." Jim Goller really loves to fish, and he also likes to cook. Here, for the first time anywhere, he shares his secret recipe that makes almost anything grilled or fried the best you've ever tasted. 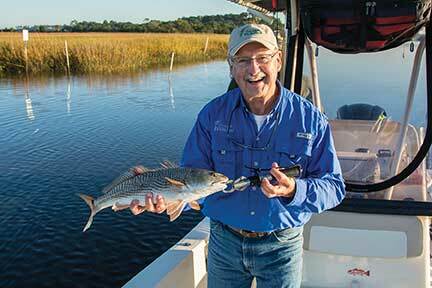 "You can fillet a redfish down the side, but leave the scales and skin on the other side," Goller said. "Put that on the grill - scales down. That is really good. Or you could take off the scales, soak the fillet in buttermilk, and dredge it through some plain flour with a little salt and pepper, and that is really good, too. But, if you want your fish to be the best it can be, you need to eat it with Goller's Goo." Goller's Goo is a legendary sauce - according to Jim Goller anyway - that is easy to whip up. "Once you try this stuff," Goller said, "you won't eat anything without it." You need half a cup of sweet orange marmalade, the real stuff not the low-sugar kind. Add a heaping tablespoon of horseradish, a level tablespoon of Braswell's Red Pepper Jelly and finally a dab or two of Texas Pete. Mix it well and put it on anything. Well, maybe not pancakes. Back at work on Monday, at the SCDNR's South Carolina Wildlife magazine section, Goller was editing the annual "Sportsman's Calendar and Almanac" when he discovered the state record for spadefish was only nine pounds. Convinced he and his friends had caught bigger fish, he went back the following weekend and caught a nine and one half pound spadefish. He got it certified as the new state record - a record that stood for only six weeks. "What did the SCDNR do but put out a press release about my record spadefish," Goller said. "Then everybody was fishing for them and in a few weeks a guy from Arkansas caught a ten pounder to break my record." While Goller was working at the SCDNR and breaking spadefish records, Chassereau was attending seminary classes to become a Lutheran minister. After graduation, he enthusiastically accepted his first charge in Beaufort, where he met Marvin Stanley, another friend who showed him the ropes in St. Helena Sound. 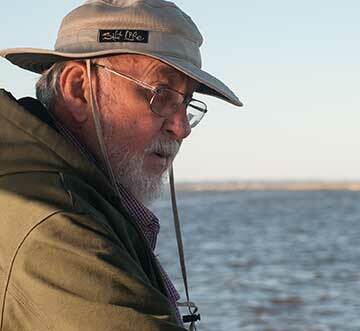 "Marvin taught me where to fish and what to use to catch blue crabs and sheepshead," Chassereau said. "I knew right away the coast was a special place, and I would return many times for the fishing, but it was always the people and the time apart from the cares of the world that I cherished most." Goller was fortunate to be introduced to saltwater fishing at a young age, but for many anglers who grow up inland, making the transition to coastal fishing can be intimidating. According to Goller, saltwater gear, especially for inshore fishing, is no different than tackle for bass or gear that striper anglers may use in freshwater lakes. Since much of the ACE Basin is privately owned, you really need a boat, he explains. "If you have a boat and you still are not catching fish," Goller said, "one of the best ways to learn where and how to fish is to go with a guide a few times. And, you should read and study the species you are targeting. The few hundred dollars you have to invest will more than pay off in more fish and a lot more fun." On the other hand, fishing pressure in the ACE Basin, in fact all up and down the coast, has increased in the decades since Goller and Chassereau started fishing here with friends. According to Bell, more than 450,000 individuals have purchased privileges to fish recreationally in the state's marine waters. Bell even expects that number to continue to grow as more people move to the coast. "Given the increase in fishing pressure that we are likely to experience in the future," Bell said, "it is more important each year for all anglers to follow the rules and adopt their own personal conservation practices and pass these along to future generations." The Harry Hampton Memorial Wildlife Fund, Inc., named for Harry R. E. Hampton, is a private, nonprofit corporation which partners with the South Carolina Department of Natural Resources for the promotion of education, research, management and the administration of game and fish laws, which benefit conservation of wildlife, marine and other natural resources in South Carolina. As the founding father of South Carolina's conservation movement, Hampton stands in the forefront as one of the great leaders of our state. Born in 1897, Hampton grew up in Columbia and Charleston when state governing of wildlife consisted only of rudimentary law enforcement. Beginning as a youth, he explored, hunted and fished a then-undeveloped South Carolina. While he was South Carolina Wildlife Federation president, Hampton's constant hounding of the legislature influenced game and fish laws as well as the formation of the State Wildlife Department and the Commission in 1952. Hampton's twenty-year effort to preserve the Congaree River bottom also ended in success with the Congaree's establishment as a National Natural Monument in 1976. Once, when Hampton was asked what made him feel so personally responsible for the wild animals and places in South Carolina, he replied, "Just bullheadedness, I guess, is at the bottom of it." For more information, or to make a contribution, go to www.hamptonwildlifefund.org. 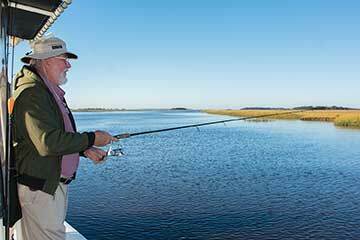 The SCDNR recommends some best practices for anglers including tips for catch-and-release fishing such as reducing fight time, using the right line and circle hooks to make releasing the fish quicker and easier. Once the fish is landed, anglers should, if possible, keep the fish in the water, never hold them up vertically, take the time to help aerate the fish and minimize handling, he explains. 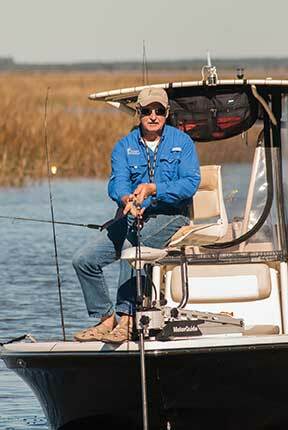 Bell hopes that anglers will continue to enjoy South Carolina's rich fisheries resources in ways that are conservation-minded. "In recent years, our saltwater anglers have demonstrated a very good track record for practicing sound resource conservation in the ways they interact with fisheries and how they treat essential habitat," Bell said. Goller recommends medium tackle for spottails and seatrout. He likes to use braided twenty-pound-test line. He says it is stronger and smaller in diameter than some other lines, allowing anglers to put more line on a reel. Although a boat is a necessity to successfully fish much of the waters of the ACE Basin, you don't need the most expensive boat. "You can catch 'em from a john boat," Goller said, "but stay in protected waters. You need to be safe. There is some big water out there, and it can really get ugly when the wind gets up." Although we spent nearly eight hours on the water on that December day, and the fishing was the reason we all came together, we left with more than just a few fish for dinner. We all found that after a day in such a beautiful place, the rest of the world looks a little better too. It's more than the smell of the marsh or sound of the waves that alters one's perspective on the stressors that await us back at the dock. The ACE has a way of making you realize how small you and your own challenges are in comparison to the vastness of this place, and it offers peace to those willing to look past the scenery, and even beyond the fish, to restore our souls. "If those who enjoy the ACE today will help ensure the health of this beautiful, productive and unique gem in the state's overall treasure of coastal habitats," Bell said, "then . . ." well, you finish the sentence and we all will hope for a happy ending. 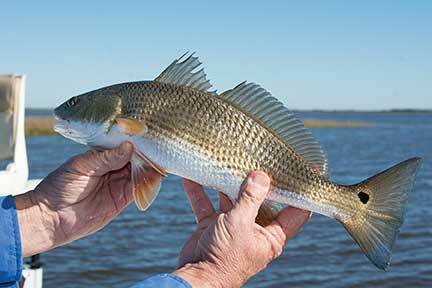 For more information about the SCDNR's best practices for catch-and-release fishing, visit www.saltwaterfishing.sc.gov, click on Publications, then click on Catch and Release, Fishing for the Future. South Carolina Wildlife staff flies high with SCDNR pilot Owen Barker to learn more about this exciting career.